"In its seventh year, Jazzdor Strasbourg-Berlin becomes more European and more cosmopolitan than ever before," says the programme. This four-day, twelve-set festival, bringing French artists to Berlin, and either developing existing cross-border collaborations, or instigating them, has a confident sense of its mission. European was indeed the word: on the first night, not a single person of North American origin stepped onto the stage, and I'm fairly convinced I didn't hear a single swung quaver/ eighth-note all evening. In his introduction, Festival Director Philippe Ochem also explained what he meant by cosmopolitan: situating the festival in Berlin meant, this year, being open to the cultural cross-currents of Berlin itself, and, for the first time, inviting musicians who make there home here. On this first night that brought to the party Berlin-resident British trumpeter and former BBC Young Generation Artist Tom Arthurs. An impressive feature is the support network around the festival. All twelve concerts are being recorded by Deutschlandradio Kultur. The programme lists a total of 24 partners and sponsors. All three acts tonight had label support: from ACT of Munich in Germany, Hat Hut of Basel in Switzerland, and Abalone of Vincennes in the Paris region of France. The highlight for me was Denis Badault's set with his quartet H3B. The idea was "Songs No Songs", alternating through-composed pieces with improvisations. Badault, a former director of the Orchestre National de Jazz, brings a kaleidoscope of different influences into both forms. The through-composed pieces settle into irregular grooves - at different points 11 and 15, I think - much aided by the impeccable placing and anchoring of bassist Sebastien Boisseau. Shifting harmonies reminiscent of Kenny Wheeler were poetically played by the Tom Arthurs, whose melodic voice gets stronger each time I hear him. Violinist Regis Huby also made his solo moments really count. In the improvised sections there were echoes of both the musique concrète tradition of Pierre Henry, and of the second Viennese school. The material has been recorded by Abalone, and there are samples HERE. I overheard Badault talking before the gig about the French stand-up tradition of Coluche and Guy Bedos. His introductions in English were slightly reticent, but nonetheless gave a strong hint that, in front of a native audience, there would be a lot of fun to be had alongside his varied, engaging, ever-inventive music. I'd love to hear him in front of a French audience in, say, the 21st Arondissement (South Kensington) or the 22nd (Kentish Town). 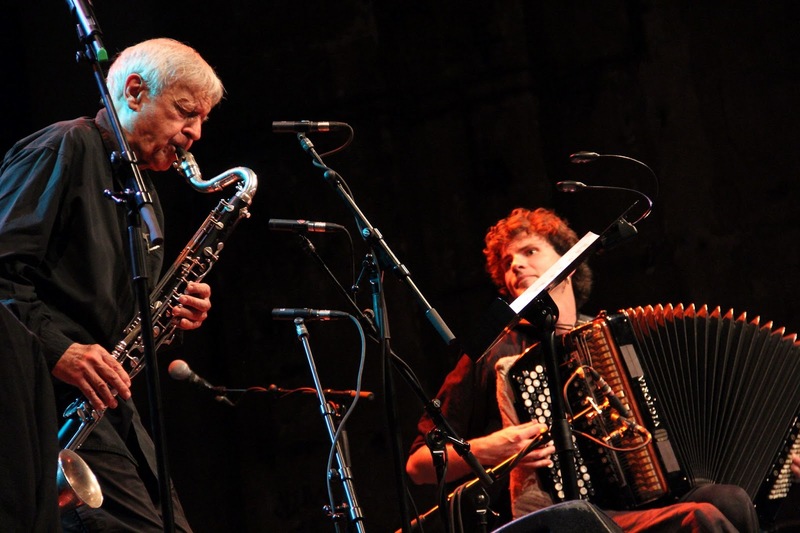 The opening set was from accordionist Vincent Peirani and clarinettist Michel Portal. I thought their album with Michel Benita and Michael Wollny, ThrillBox (ACT- REVIEWED HERE) was just a stunnningly good piece of work, and was curious what would happen once they removed the Michaels and perfomed as a duo. I have to say I did miss the other voices. The duo set was nevertheless a great festival-opener, bringing the audience onside with approachable music. There were no introductions, but the audience's attention - even that of quite a few children - was held throughout. Peirani is definitely a rising star. The most challenging no holds-barred music came from the trio of Swiss trombonist Samuel Blaser, guitarist Marc Ducret and drummer Peter Bruun. There was a fascinating contrast between Peirani in the first gig, with Ducret in the second. Both occupied exactly the same space on the stage, but where Peirani had been all smiles, knowingly egging on the audience, Ducret's laser-like gaze was on the music, on the process, on the shifting sound-world he and his colleagues were creating One impressive thing about this trio was the power of the pulse. Both Blaser with his vocalized trombone harmonics, and Ducret and his free lines are such rhythmically forceful players, it allowed Bruun a completely free role, which he took superbly. Ducret and Blaser have recorded Boundless for Hat Hut. An opening night full of contrasts was performed for a more-or-less full capacity audience, who were happy to drift out into the cobbled yard to enjoy the evening sun between sets (above).